The man had his asylum request turned down. THE SUSPECT WHO stormed into a supermarket in Hamburg and killed one person with a knife was known to authorities as an “Islamist” according to the city’s interior minister. “He was known as an Islamist but not a jihadist,” said Andy Grote, noting that while there are indications that there could have been an Islamist motive for the attack, the suspect also suffered from psychological problems. The suspect, a 26-year-old born in the United Arab Emirates, was quickly overwhelmed by passers-by and arrested after yesterday’s attack in Hamburg’s Barmbek district. Grote said the man’s motive remained unclear today, but he is believed to have acted alone and has not been linked to an extremist network. It is understood he had an application for asylum rejected. The man stabbed at least five other people. Grote said none of the survivors’ wounds are considered life-threatening. 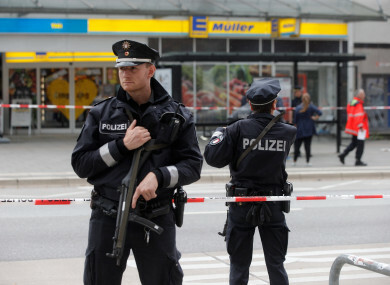 Police said that they were “investigating in every direction.” The news agency dpa quoted two witnesses at a nearby bakery as saying they heard the assailant shout “Allahu akbar!” as he held up the knife, but police did not confirm the report. Mayor Olaf Scholz said the assailant was a foreign national who was supposed to leave Germany but couldn’t be deported because he had no papers, dpa reported. “It makes me all the more angry that the perpetrator is apparently someone who sought protection here in Germany and then turned his hatred against us,” Scholz said. Email “Man who killed one person in Hamburg supermarket was known to authorities as 'Islamist'”. Feedback on “Man who killed one person in Hamburg supermarket was known to authorities as 'Islamist'”.